Saving money on a new vacation home in sunny Florida can make you even happier when you travel to The Happiest Place on Earth. 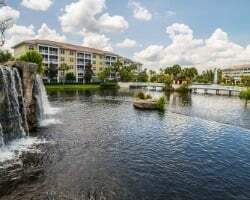 At SellMyTimeshareNow.com, we have discounts on Sheraton Vistana Villages Bella Florida timeshare resales and rentals that could save you thousands of dollars! Located right on I-Drive, Sheraton Vistana Villages is the central hub of all things Orlando. Within short reach of Walt Disney World, Seaworld, and Universal Studios Florida, Sheraton Vistana timeshare owners have the famed theme parks right at their fingertips. Sheraton Vistana Villages Bella Florida is one of four wonderful timeshare phases for this property, and offers a great vacation experience that will have your family traveling back year after year. The phase overlooks the wide, shimmering Bella pool, a temptation that will draw owners out to go for a relaxing dip or soak up some sun in one of the lounge chairs. Everything is easy at Sheraton Vistana Villages Bella Florida; you can even plan your vacation easier using the resort's Vacation Planning Desk. They’ll help you explore options with expert information and provide discounted tickets for you and your family to enjoy a day at one of the major theme parks, or make great recommendations for you and that special someone to enjoy a great dinner at any one of the fine restaurants in the area. But all the fun attractions and activities could be so much better when you have a great place to come back to. Sheraton Vistana Villages Bella Florida is your ideal vacation not only for its great on-site amenities, but for its beautifully appointed one- and two-bedroom villas. Wake up every morning to a breathtaking view of the resort and pool from outside of your private balcony or deck. Cook the family up some breakfast in the fully-equipped kitchen, plan out your day in a comfortable, relaxing atmosphere of your living room. Then once you’ve exhausted yourself for the day, take a long soak in the whirlpool tub located in the master bedroom. The lovely villa the perfect beginning and end to every day in the Happiest Place on Earth. So don’t wait! Fill out the form on the right or call 1-877-815-4227 to speak with our Sheraton Vistana Bella Florida timeshare resale specialists today. Don’t forget to check out the other phases at Sheraton Vistana Villages: Amelia Villas, Key West Villas, and St. Augustine Villas. The benefits of purchasing your Sheraton Vistana Bella Florida timeshare on the resale market are plentiful! You could save thousands of dollars off what the retail price is when you purchase your property directly from the current owner. There are no hidden fees; you’re simply paying the most accurate cost of the property based on the current trends of the secondary market. Enjoy a number of great advantages from purchasing your Sheraton Vistana Bella Florida timeshare resale. You’ll have more control over the flexibility of your vacation by choosing a fixed or floating week and annual or biennial vacation options. Owners of floating weeks also get the option of choosing for a variety of different seasons to vacation, including the most-sought after Platinum season. Like other resorts in the brand’s catalog, Sheraton Vistana Villages Bella Florida is affiliated with Starwood Vacation Ownership. Starwood is renowned for its luxurious resort properties and cost-effective prices. 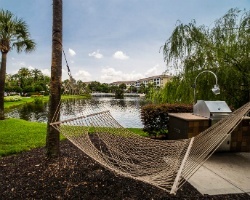 Sheraton Vistana Bella Florida is one of the lucky few timeshare resale properties that is eligible for StarOptions, the brand’s points-based ownership program. StarOptions allows for more flexible vacation and other great perks you can find on our Starwood Information Center page. With over 2,900 resorts in over 80 countries, Interval International stands tall as the second largest external timeshare exchange company in the industry. 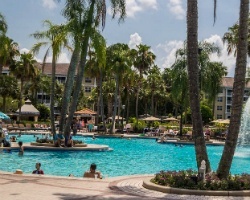 Sheraton Vistana Bella Florida timeshare owners can purchase a membership to II for an additional fee and have access to thousands of resorts to exchange with their vacation week. Sheraton Vistana Villages Bella Florida Villas has been rated an “Interval International Elite Resort", which means that the property is of high demand and therefore affords its timeshare owners the ability to choose virtually any available vacation week they choose in the exchange program. 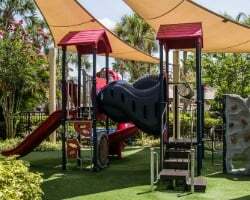 Sheraton Vistana Bella Florida, the largest and most seasoned phase of the Vistana Villages phases, features some amazing amenities on-site including a game room, fitness center, jacuzzis, children’s playgrounds, several different grill stations and so much more. Enjoy some downtime playing a few sets of tennis on the resort’s courts or spend the whole day relaxing and having a couple of cocktails at the Pirate’s Cove poolside bar. Let the kids have their fun over at the St. Augustine pool which features and amazing water slide, and interactive pirate ship, a water cannon and water fountains. It’s the perfect way to cool off after a long day of walking around in the warm Florida sun. You’re also in close proximity to the resort's massage center, whose treatments could offer you a much deserved break after you’ve planned a happy, active vacation for the rest of the family. Already Own at Sheraton Vistana Villages Bella Florida Villas?